My boyfriend’s brother swears that eating primarily soup during the cold months is the best way to keep warm. And I have to say, I’m going to trust what he says because he is a mechanic and works outside all winter long. So if he has found a way to keep warm, I’m following suit! 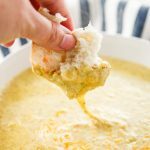 I am partial to Creamy Broccoli Cheddar Soup and served with a loaf of crusty french bread. There are many great pairings to eat with soup. I’m partial to a crusty french bread or sourdough and if i find it, a bread bowl! Other tried and true options include oyster crackers, saltines and townhouse flipsides. Some offbeat options include fresh croutons, toasted baguette and homemade crumb toppings. If you want to learn some fun facts about soup, check out the survey results Campbell’s published last year HERE. One part of living in San Francisco that I haven’t gotten used to yet is not having seasons. San Francisco is in a microclimate so it stays about 65 degrees all year long. The temperature doesn’t fluctuate between seasons and even though we live in the “sunny” area, it’s foggy and cold a lot of the time. Cold weather comfort food is a must, because we need it all year long! I’m ok with it because it’s my favorite type of food. 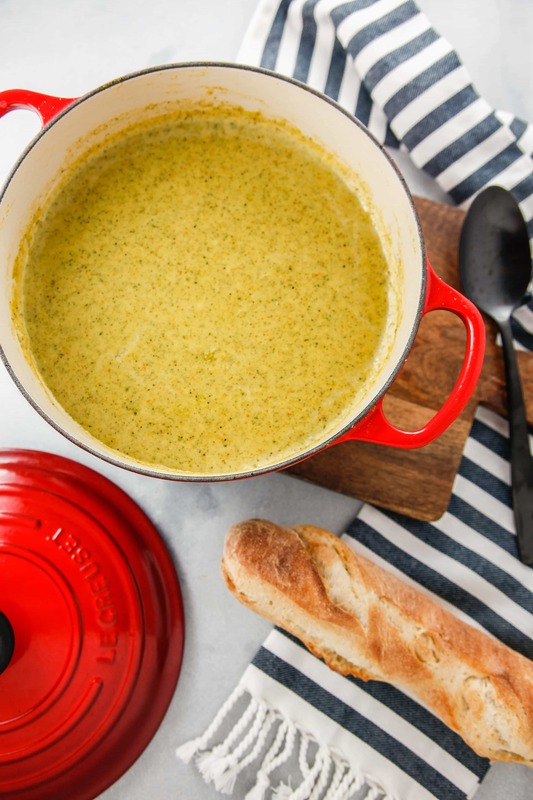 Warm up this winter with a classic Broccoli Cheddar Soup. 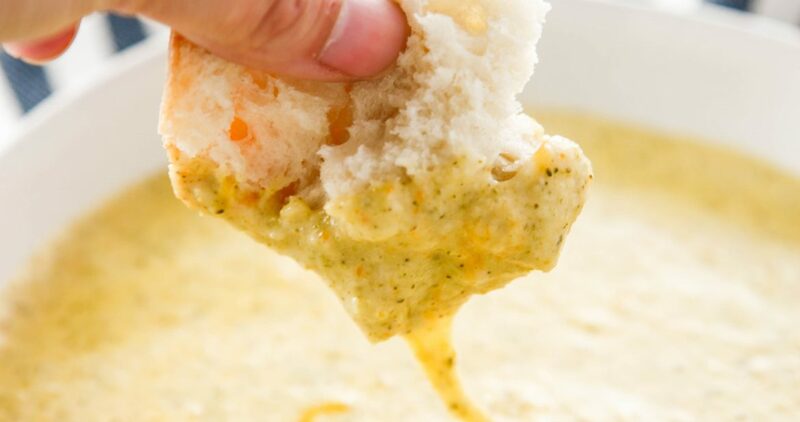 Panera made this a cold weather staple, now it's time to make it at home! Melt butter in a large dutch oven. Add onion and carrot and cook over medium heat until softened. Mix in flour and stir to coat. Stir in half and half and chicken stock. Add broccoli, bay leaf and season to taste with salt and pepper. Cover and let simmer for 15 minutes. Remove bay leaf and stir in cheddar cheese. Remove from heat and use an immersion blender to blend soup together. Serve and enjoy! 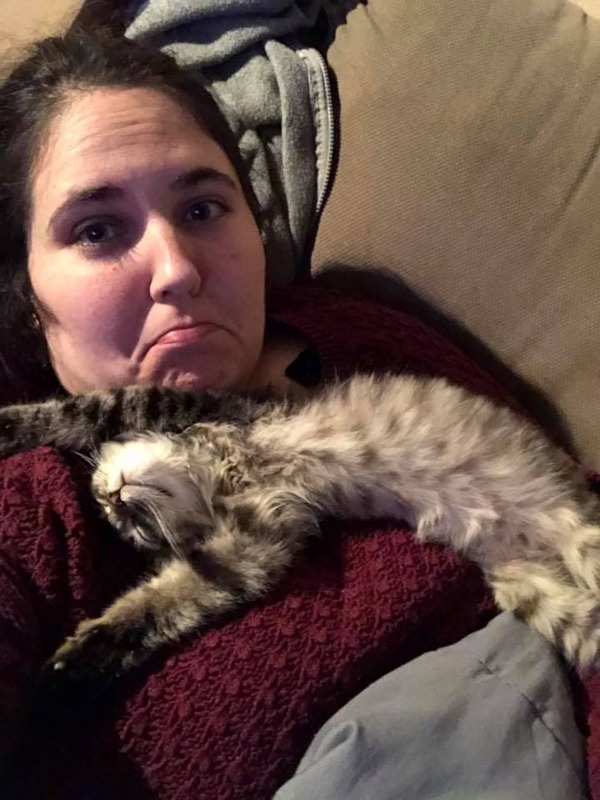 Arya likes to sleep upside down and usually on me. She’s been doing this since she was a baby and for whatever reason this pose stuck! Anyone else have a weird cat? I need comfort food like this too. I live in the Seattle area where 65°F is pretty standard. 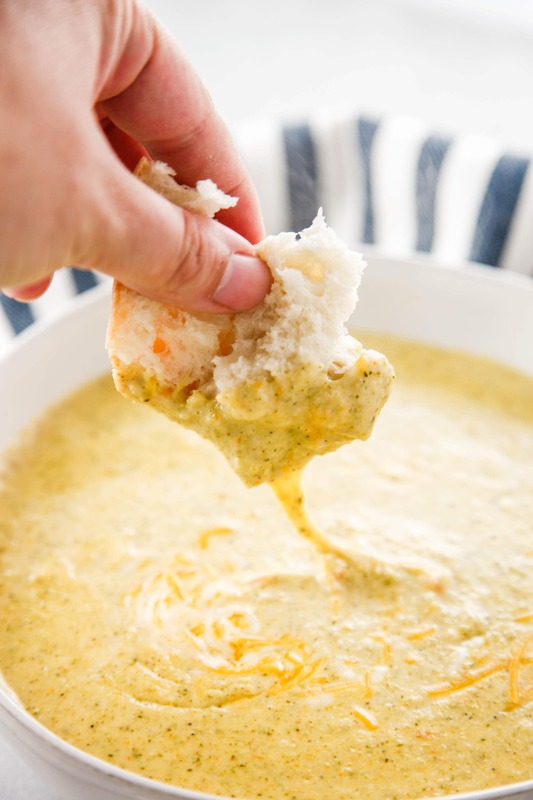 Creamy broccoli cheddar soup is gonna be whipped up this weekend!! I feel ya, I’m in San Francisco and the temperature is about 65 all year round. I miss warm weather! oh this soup looks over the top comforting and I love that how your cat is all sprawled out so cute! I love that you used half and half which will make this so much creamier! I’m ready for some comfort food! 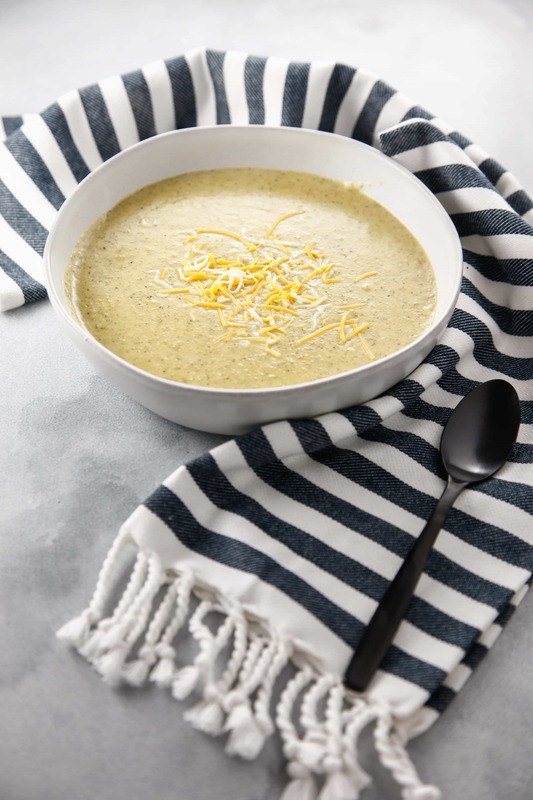 Creamy broccoli soup with cheddar would certainly fulfill that craving. Now, along with that I love crusty bread. I’m a dunker– I got that from my Italian parents. That soup is going on the roster. My kids would love this soup. Love the cheesy cheddar addition. Can’t wait to try. Saving for later. Gah!!! Just what I need, but I’m out of carrots. 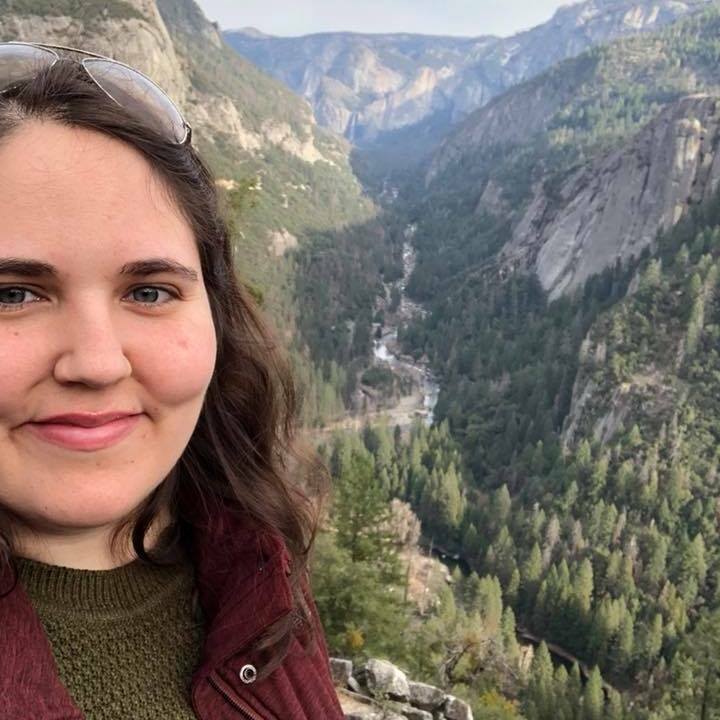 This looks fantastic, Michelle! Can’t wait to dig in. This perfect soup for fall season, once the temperature get cool down. Broccoli and cheddar soup is my favorite. I will finish the bowl in one siting, so good.